We provide our clients with the highest quality aquariums and fish tanks designed for both commercial and residential use. Check out some of Living Art Aquatic's work! We have images of our aquariums, fish tanks, custom cabinetry and more! See anything you like? Call us today to learn how to create an Artistic Seascape in your home. Living Art Aquatics has a full service maintenance team to care for your fish tank and aquarium system at your home or business. 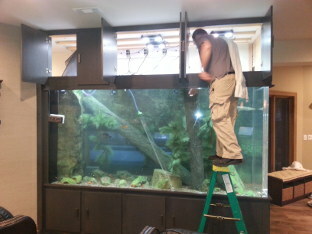 We also do aquarium restoration to give your aquarium new life! We specialize in bringing the Midwest the most original professionally-designed aquariums. providing the highest standards in custom built aquariums, fish tanks, complex filtration systems, and custom cabinetry. For over 20 years, Living Art Aquatics in Crystal Lake, Illinois has specialized in introducing tranquil and varied underwater life into your surroundings. In fact, we specialize in the construction of Custom Aquariums, Fish Tanks, Filtration Systems and Custom Cabinetry. Our professionals are experts in designing aquariums that go hand-in-hand with your home or office environment. They work closely with you in creating a custom design in the comfort and convenience of your home or office. We also have a complete Maintenance Department. Whether it's a new system we've installed or one you already own, our maintenance team can make sure that your aquarium provides all the pleasure without any of the hassle. All of our technicians are also hobbyists and have a deep understanding and love for the industry. They have been specifically selected for their positions and have undergone extensive training so you can be sure that under our care, your system will thrive and grow. Additionally, we maintain a large in-house inventory of fresh and saltwater fish and coral available for purchase. All of our livestock goes through a quarantine period after they arrive from our suppliers. This guarantees that they are disease-free and eating so they can be placed in your system without fear of contamination or loss.
" We wanted to thank you for our beautiful reef aquarium that you and your crew... "
" I want to extend my compliments to the person taking care of our showroom aquarium! It... "